25 Billion Paper Cups Thrown Away? 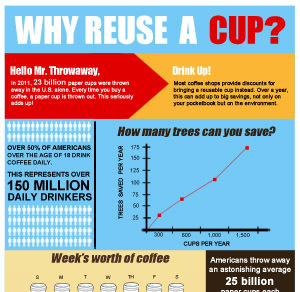 Last year 25 billion paper cups were thrown away just in the United States. This number may seem staggering, but think back to how many disposable coffee cups you saw this morning and how many to-go cups you saw at work after lunch. Disposable cups are a common sight and they easily pile up in our landfills. Many paper cups are difficult to impossible to recycle – the plastic coating that allows the cup to hold fluids is great for preventing leaks, but it also thwarts any effort to recycle the cup. Plastic cups are not much better since people typically toss them in the trash when they are done instead of recycling them. Take a stand and say goodbye to your disposable cup habit and switch to eco-friendly reusable cups and reusable water bottles. Each time you use a eco-friendly reusable drink container you prevent a disposable container from being thrown into a landfill and wreaking havoc on the environment. Even better, take a cue from the restaurants and coffee shops who emblazon their names and logos on disposable cups and create a custom reusable coffee mug or water bottle from Factory Direct Promos. Select the style and colors you like and have your logo or branding message imprinted directly on the eco-drinkware. Each and every time your clients and employees use this cup or water bottle, whether grabbing their morning coffee at your shop or while staying hydrated at the gym, they will keep eco-friendly disposable drinking containers out of landfills and help increase your brand recognition. Handing out eco-friendly reusable drink containers at your next tradeshow or convention, or offering them at your restaurant or to your employees, not only helps the environment but it can also save money and help you increase brand recognition. In addition to saving trees and reducing CO2 emissions, eco-friendly reusable drink containers can also save money. Many coffee shops and food courts already offer a discount to customers who bring their own reusable coffee mug or water bottle. Since the business saves on the expense of handing out the reusable cup they already paid for they do not pass this expense on to the customer. Next Next post: Urban Beekeeping for Business? Why Reuse a Cup? Check Out Our Infographic and Find Out!